Neil Hamilton's appearance alongside a far-right activist at a rally in London brings shame on the Senedd, Plaid Cymru AM Leanne Wood has said. She called for the UKIP AM to be sanctioned over his appearance at the "Brexit Betrayal" march alongside Tommy Robinson. 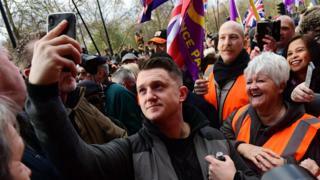 The former English Defence League leader protested with UKIP UK leader Gerard Batten and others on Sunday. UKIP Wales accused Ms Wood of not respecting freedom of speech. Mr Robinson was recently appointed as an adviser to Mr Batten, prompting a number of people to resign from the party, including former leader Nigel Farage. Footage of the event and pictures on social media showed Mr Hamilton stood at the back of a stage as Mr Robinson addressed a crowd. Mr Hamilton also spoke at the event in central London. Referring to the far-right activist by his real name of Stephen Yaxley-Lennon, Ms Wood called him an "Islamophobic far-right bully", who "has no place in mainstream politics". She said the AM in question "has no shame, but his sharing of a platform with such a reprehensible and dangerous character brings shame on this Senedd and brings shame on Wales". Welsh Government minister Julie James said most AMs would be outraged at the appearance of the UKIP Wales leader at the rally. "Its appalling to think that someone among our midst with effectively a far-right extremist is a perfectly reasonable thing to do," Ms James said. Image caption Leanne Wood said Tommy Robinson had "no place in mainstream politics"
UKIP AM David Rowlands, who has opposed Mr Robinson being given UKIP membership, would not comment directly when asked by BBC Wales on whether Mr Hamilton was right to go. "That was down to Neil," he said, saying the group had decided it would be down to "each individual AM to do what they feel it would be appropriate". But he said he did not feel it was appropriate to attend the March. "It's Tommy Robinson's background really," Mr Rowlands said. "The problem is to me the interpretation the media might put on it," he said. He said he felt "it would be opening the party up to a great deal of criticism". A spokesman for UKIP Wales said: "Neil Hamilton spoke at a Brexit rally in London on Sunday. Tommy Robinson was another of the speakers at that event. "We note the exchange between Leanne Wood and Julie James in the chamber, and the evident lack of respect for freedom of speech." He said when Plaid Cymru stops its "anti-democratic denial of the Brexit vote in Wales, maybe we won't need to go on this kind of rally". Mr Batten told the crowd on Sunday: "If Parliament does not take Britain out of the European Union it will be the biggest constitutional crisis since the English Civil War. "In 1642 the king put himself in opposition to parliament. Parliament won and the king lost his head."